We have been working with the North Central Neighborhood Association to develop plans, permits, and partners to complete a park beautification project. Enough Pie has secured funding for murals to be painted on the I-26 underpass columns inside of the park. We are in talks with a local artist and local artist supply store and plan to begin this project early spring 2015. 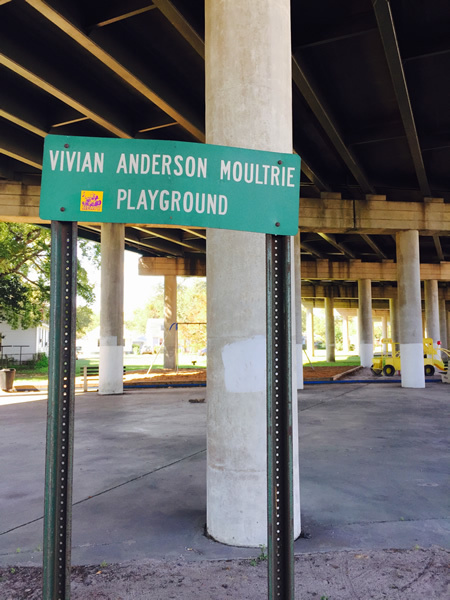 This project will most directly impact the North Central neighborhood, but anyone who enjoys Vivian Moultrie Park will benefit. The project also highlights the rationale for more usable space under I-26 and more murals throughout the area. Murals are funded and in planning stages. We are looking for more partners to complete a full park beautification project. If I was Mayor, I would make the permitting and approval process for the murals a piece of cake! We would like to partner with Charleston Parks Conservancy to improve the park flora and fauna, and we would also like to secure partners for a very creative and wonderful playground as well as park benches and picnic tables.